Editor's Note: This version replaces a prior one that suggested rollout had already started. When Google Buzz debuted a month ago, integrating a new social network into your GMail, it did not roll out to business accounts running GMail on Google Apps. At the time, the company promised Apps customers would see Buzz added "within a few months." 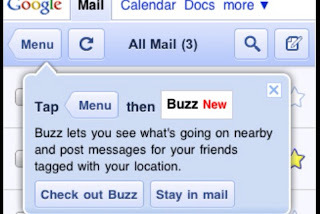 A premature promotion of the mobile version of Buzz to both consumer GMail users and Apps users made some see Buzz erroneously, before its time. On Tuesday, as Susan Beebe's showed, many Apps users saw Buzz appear as "New" in their GMail settings, with a description of the new service. But that excitement proved to be short-lived, as explained by Todd Jackson, GMail Project Manager at Google, late Tuesday night. "Nope, we haven't released Buzz to Apps customers yet. We had a small issue this afternoon where we mistakenly promoted the mobile version of Buzz to both consumer Gmail users and Apps users, but this is now fixed," he said. When Buzz actually does go live for Apps, the social sharing service, which took some initial criticism for aggressive connecting and transparency, taking a step into the corporate world, will need to do so tentatively, as discovery of partnerships, let alone recruiters or other relationships, is more dicey than familial or casual friend connections that dominate most GMail activity. Buzz Rolling Out to Google Apps? Susan showed screenshots of Buzz appearing in the mobile version of Susan's GMail account, where Buzz is marked as "New", and features a short description of the service, as letting you "see what's going on nearby and post messages for your friends tagged with your location." 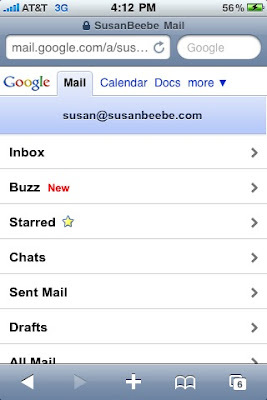 Susan Shows Google Buzz In Her Apps-Enabled GMail. Whether you use Apps or not, you can find me on Buzz here. TheNextWeb also reported similar early deployment, which has since been explained.